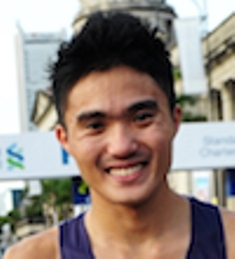 2011: He bettered the previous Singaporean 5000m NR of 14:57.61 by Naarajan Ganeson in 1995 with an effort of 14:51.09s at Kanagawa on May 28, 2011. A week later (5 June 2011) he won the Christchurch Marathon in NZL with a time of 2:26:34 (PB). 2010: Silver medal at 5000m (34:38.30) in the ASEAN University Games. 2007: Competed at Triathlon in SEA Games (Nakhon Ratchasima) and bagged the gold medal (2:05).